Regular readers are aware that Democratic opposition research firm Fusion GPS has cropped up several times in my work over recent weeks, as the country seeks answers on Moscow's interference in the 2016 election (over which federal authorities may soon file charges against six Russian officials responsible for the DNC hack, the investigation of which was...strange, and possibly tainted by none other than Fusion GPS). Recall that the firm in question hired ex-British spy Christopher Steele who compiled a controversial, unverified, and at least partially discredited anti-Trump dossier that purportedly relied on information from high-level Russian sources (and whom the FBI continued to pay until that highly questionable decision was publicly reported). The co-founder of Fusion GPS, the firm behind the unverified Trump dossier, met with a Russian lawyer before and after a key meeting she had last year with Trump’s son, Fox News has learned. The contacts shed new light on how closely tied the firm was to Russian interests, at a time when it was financing research to discredit then-candidate Donald Trump. The opposition research firm has faced renewed scrutiny after litigation revealed that the DNC and Hillary Clinton’s campaign paid for that research. Congressional Republicans have since questioned whether that politically financed research contributed to the FBI’s investigation of Russian collusion with the Trump campaign – making Fusion’s 2016 contacts with Russian interests all the more relevant. The June 2016 Trump Tower meeting involving Donald Trump Jr. and Russian lawyer Natalia Veselnitskaya occurred during a critical period. At that time, Fox News has learned that bank records show Fusion GPS was paid by a law firm for work on behalf of a Kremlin-linked oligarch while paying a former British spy Christopher Steele to dig up dirt on Trump through his Russian contacts. But hours before the Trump Tower meeting on June 9, 2016, Fusion co-founder and ex-Wall Street Journal reporter Glenn Simpson was with Veselnitskaya in a Manhattan federal courtroom, a confidential source told Fox News. Court records reviewed by Fox News, email correspondence and published reports corroborate the pair’s presence together. 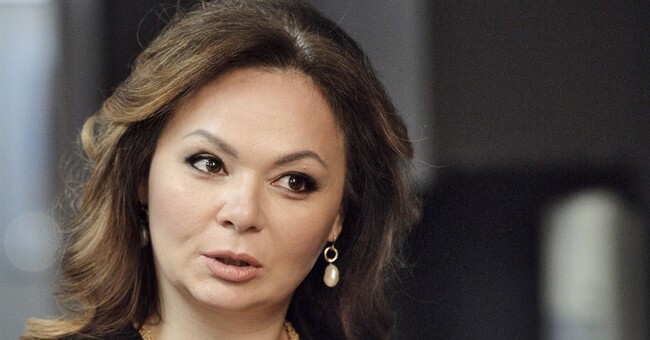 The source told Fox News they also were together after the Trump Tower meeting...NBC News first reported that Veselnitskaya and Simpson were both at a hearing centered around another Fusion client, Russian oligarch Denis Katsyv. His company, Prevezon Holdings, was sanctioned against doing business in the U.S. for its alleged role in laundering more than $230 million...Fusion’s Simpson is believed to have been working with Veselnitskaya and Rinat Akhmetshin, a former Soviet counter-intelligence officer turned Russian-American lobbyist, to overturn [unrelated] sanctions. Akhmetshin also attended the June 9 Trump Tower meeting, along with about a half-dozen others including Trump Jr., Paul Manafort, Jared Kushner, publicist Rob Goldstone, Natalia's Russian translator Anatoli Samochornov and Ike Kaveladze from a Russian-American real estate agency. This is another bizarre twist to a complex and confusing story, which is clarified quite well by John Sexton here. Fusion GPS (which has resisted efforts by House investigators to access its bank records and other documents) wasn't merely working for Russians while it was also paying Steele to dredge up damaging information on Trump. Fox has now revealed that one of the central figures in the "Trump collusion" narrative actually met with the founder of the firm before and after (that same day!) the infamous Trump Tower meeting at which Donald Trump, Jr. and two other senior campaign officials evidently attempted to collaborate with Russians against Hillary Clinton. The firm will say that this timing was a pure coincidence, and Ms. Veselnitskaya was connected to the anti-Magnitsky Act lobbying push, so it would follow that Simpson and her paths would cross. Less credulous observers may find this "coincidence" too curious to simply accept as innocent. Predictably, some Republicans are citing this development as more "proof" that it was Democrats who colluded with the Kremlin last year, but that's still an overstatement. We don't have a complete picture of what happened, but this newly-exposed detail should be probed. Once again, thoroughly resolving the Russia matter and preventing future subterfuge requires turning over every stone, including ones that aren't likely to lead to Donald Trump's door. Fortunately, Robert Mueller seems to be pursuing such a path. The relevant portion of the applicable statute states that grossly negligent handling of classified material is a crime. Now we know he used that phrase in an initial draft of his (damning) exoneration statement. I'll repeat that the "gross negligence" standard set out in the Espionage Act does not require proof of intent, the fig leaf by which Comey cleared Hillary of potential charges. Of course, he was wrong about her supposed lack of intent, too.